This week has been CRAZY so I didn’t have time to photograph my last two looks I wore. Here are iPhone snaps from my Instagram and where you can find everything! Also I had TONS of questions about my sunglasses. They are Dior from Nordstrom in the Pink/White color. There were a few people saying in the comments on my Instagram that they were $600 BUT good news! They’re actually on sale (25% off) for $337, originally $450. Here is a similar pair of pink mirrored sunglasses that are not as expensive too! Love the blush tee and the duster cardigan. You always have the best classic, casual looks! You make casual look so much better than I do! haha Beautiful! Great outfits and I love your home style, the mirror is so beautiful! Love love love the pink theme!! 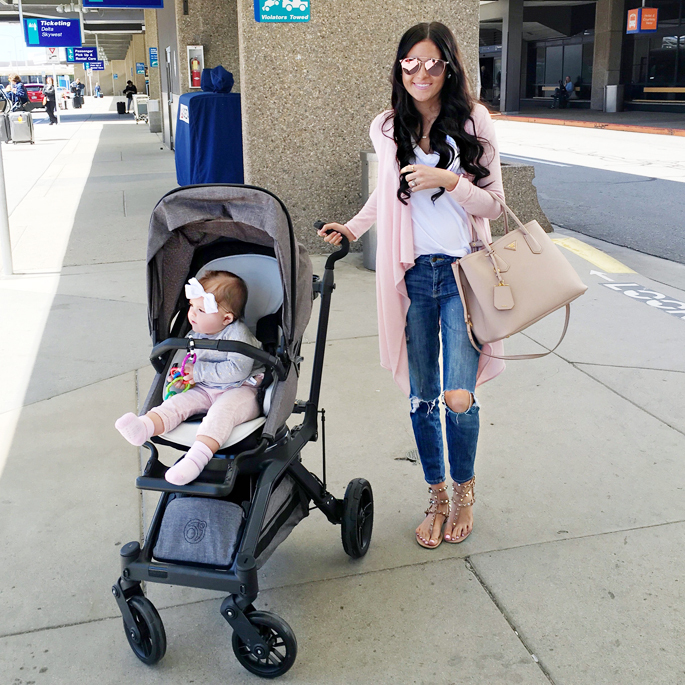 The best part of having a baby girl, she can match the pink outfits ;) This cardi looks like it would be amazing for travel too!! Adorable! Love you in blush tones! Great casual looks! Love that gold mirror. The floower on coffe table? Tnx. Lots of kisses for u & Iittle Isla ? love that cardigan! and the one you linked is such a good option! Great casual on-the-go looks. Those sunnies are too cute, and what a great price now that they’re on sale! Can’t wait to see where you’re headed…rStheCon? Those sunnies are AMAZING. Definitely need them. Rach, you’re just lovely, I adore all the pink, always… and saw your Snapchat of Isla on the plane (apparently Dash came along too! )… where are you headed? Today’s Post: Jag Jeans Style Series: Denim Jacket for a Brunch Date! Thanks so much Amber! And he didn’t really come along, just Isla’s “toy Dasher” ;) We are in Florida! Great insta round up! I really like your outfit in the first photos! Love that long pink cardi! So cute and comfy! you are the cutest person I have ever seen! Little Isla is too cute! Love the pink sunglasses. Love the blue, white and pale pink color combo for spring! Love your home and outfits! If you don’t mind sharing where you bought the paintings that are hanging in your wall. They are beautiful! Thanks. Love your round up! Dying for a pair of Valentino Sandals! 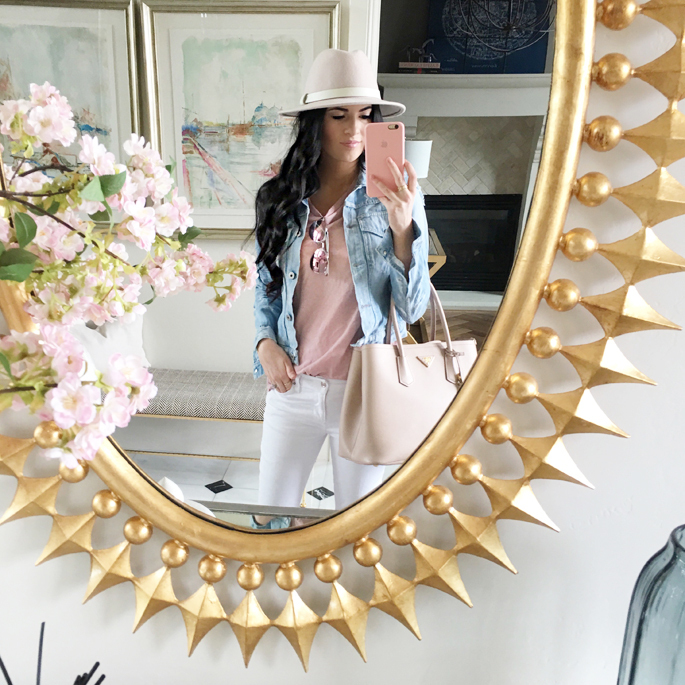 I love the combination of pretty pastels with destroyed denim! Cute outfits! Love the light colors. I love the color of that hat! Great for spring. Love this quick little shoot, that blush cardigan is so cute! I love the second look! Love your sunnies, they’re super cute! Can’t wait to see where you’re off to! Love those distressed blue jeans! Love your mommy style looks and love your Instagram! I love the mirror and the outfits! So cute! Love both of these looks! I love how the pink looks with the denim! Seriously LOVE both of these looks! Plus those sunglasses are to die for! the baby looks so cute, love your post! Super cute! Loving all of the blush! Cool look. I love your sunglasses! Fab outfit, would wear the entire thing in a heartbeat – gorgeous!! What a pretty look, I love the aviators! You look so cute in both of those!!! I’m definitely one of the followers obsessed with those Dior shades– I love how they’re feminine with a bit of edge. I love your latest looks Rach! Blush pinks and nudes are my absolute favourites! I hope you’re having an amazing time in Florida and congratulations to Megan! Loving all of the blush. No wonder you’re getting so many complements on those sunnies!! They are amazing! I love the pastel top paired with white jeans. Those sunnies are fierce! Amazing look! Loved the jeans shirt, I have plenty and I love wearing it with skirts, shorts and pants. It goes with everything. Gorgeous casual looks! Love the sunglasses.